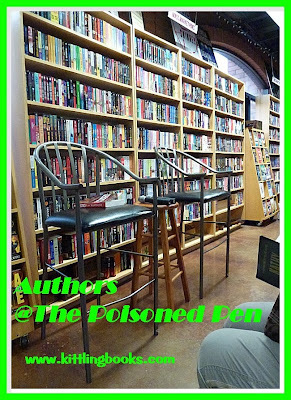 @ The Poisoned Pen with Sara Paretsky! Halloween was a very special night for Denis and me. 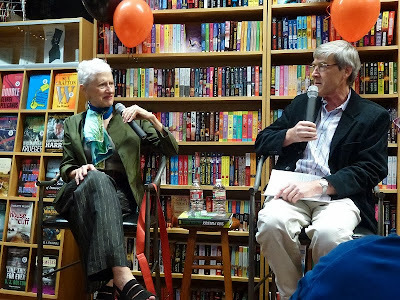 We headed over to our favorite bookstore, The Poisoned Pen, to see one of the masters of crime fiction, Sara Paretsky. 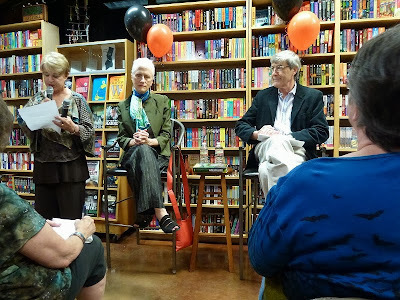 In preparation for The Poisoned Pen's twenty-fifth anniversary next year, owner Barbara Peters is introducing a few new things. Since Sara Paretsky is published by Putnam, for that one night all Putnam titles were 25% off. It was a packed house, and when that announcement was made, all the bookshelves were being perused even more intently than before! Peters' ideas are keeping her staff hopping, but they do everything with a smile, and I have to admit that I'm looking forward to seeing what else Barbara Peters has up her sleeve. Knowing that the place would be packed, Denis and I arrived extra early, and as I was watching Ariel put the finishing touches on her Halloween decorations, I couldn't help but overhear snatches of the conversations zinging back and forth all around me. Phrases like "My daughter-in-law considers books to be clutter" made me shudder, and ones like "If it takes 100 pages to get into it, I'm out of it" made me feel a bit of kinship to the speaker. One person even had a very strong reaction to a book on one of the tables due to it containing what she believed to be gratuitous violence toward women. I stayed out of that one for several reasons. I hadn't read the book, so I didn't have an opinion on it, and even if I did, I would not have changed the woman's mind. Also, a bookstore-- like a library-- caters to many different reading tastes, not just the tastes of one person. "It may be a deeper evening than you'd anticipated." Barbara began the evening by introducing Arizona State University Dr. Paul Davies, who-- in a change of pace would be talking with Paretsky instead of Barbara Peters. Davies is a theoretical physicist who is also concerned with quantam physics, astrophysics, astrobiology, and cosmology. He has established BEYOND: Center for Fundamental Concepts in Science, a sort of "cosmic think tank." When Barbara began to introduce Sara Paretsky, I could actually feel the temperature rise in the room. People were thrilled to be able to see her. In 1982 Paretsky published Indemnity Only, the very first V.I. Warshawski novel. She is the founder of Sisters in Crime. In 2002 the Crime Writers Association in the UK awarded her the Cartier Diamond Dagger, and in 2011 she was awarded the Grand Master Award by the Mystery Writers of America. "As you can see," Peters said, "this may be a deeper evening than any of you had anticipated." She then turned the evening over to Paretsky and Davies. "...a real estate deal in New York City." 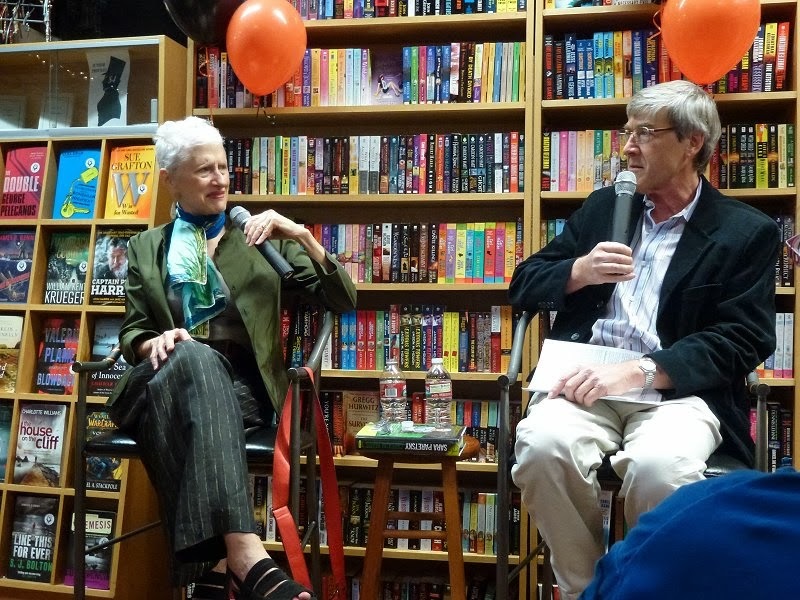 Davies began by mentioning that Paretsky is married to a physicist, and that her latest book, Critical Mass, has at its heart the Manhattan Project-- the race to develop the first atom bomb. "Most of today's youth think the Manhattan Project is a real estate deal in New York City," Davies quipped. Paretsky's own background is tied to the book. In 1911 her grandmother escaped a pogrom and her grandfather from being conscripted into the Tsar's army in Russia. Everyone in the family who stayed in Europe died during the horrible years of World War II. In researching Critical Mass, Paretsky went to Vienna, Austria. In the airport in Vienna on her way home, her bra set off the metal detector, and it was decided that a more thorough search had to be conducted. "If you can imagine a Jew with my background standing naked in front of people in uniforms in Austria, you can get an idea of how awful I felt. Half of me wanted to protest the way I was being treated. The other half of me didn't want to miss my flight." It was obvious that most of the people in that room had put themselves in Paretsky's shoes. You could've heard a pin drop. To lighten the mood somewhat, Davies told of teaching in Australia where he was the successor to a "mad professor." Davies had been spending hours at the old professor's desk doing his work, licking stamps that he'd taken out of the drawer, etc. 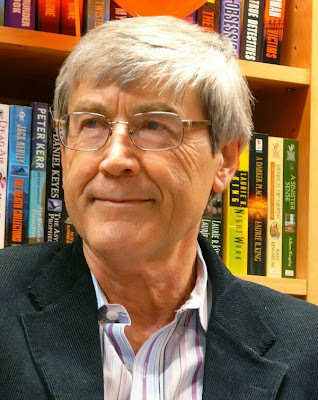 When he learned that the mad professor had kept uranium ore in that very same desk, he immediately went to the Royal Adelaide Hospital to get the radiation levels in his body checked. That piece of office equipment got checked out as well. Come to find out, Davies had been working at the most contaminated desk in the Southern Hemisphere! "They used to be extremely sloppy with their safety procedures in the early years," Davies said. "Now they've probably gone even further in the opposite direction." Davies then went on to talk about Enrico Fermi, one of the greatest twentieth century physicists. Fermi was an Italian who moved to Chicago. He created the first controlled nuclear chain reaction under the squash field at the University of Chicago. When it became feared that the Nazis would be the first to create the atom bomb, the Allies formed the Uranium Commission. Since the British who were invited to speak all had Germanic-sounding names, they sent an Australian, Mark Oliphant, to speak to the Commission. "If there is to be a bomb, it will cost $25 million. The British don't have the money or the manpower to do it, so it's over to you chaps." The Americans found themselves in a deadly race against the clock to create the atom bomb before the Nazis. "I need to be home...."
All this information was fascinating, but Peters could see that they were getting away from Sara Paretsky and Critical Mass. "Do you plot ahead in your books?" Peters asked Paretsky. "No, I have to see my characters in motion... see how they react to each other," Paretsky replied. "When I began writing this book, I envisioned a great chase scene in Vienna, but when I wrote it, it was some of the worst prose I've ever committed to paper." She did use snippets from it, but "for large action scenes, I need to be home in Chicago," Sara told us. She then went on to talk about a fascinating woman upon whom she based one of her characters. Marietta Blau was an Austrian physicist whose work was so brilliant that Albert Einstein and others wanted her and her work on cosmic rays nominated for the Nobel Prize. As the Nazis began to rise in power, several scientists tried to whisk her out of Vienna and away from Hitler's clutches. Finally, Blau got a job in Mexico City. Alas, a man won the Nobel Prize after basing most of his work on what Blau had already done. If you think he credited her for anything, think again. "A Harley with a sidecar?" In Critical Mass, V.I. Warshawski is looking for the missing granddaughter of a physicist. There is a canine dimension to the book, since Warshawski has two, and she stumbles across an injured Rottweiler during the course of the book. As Paretsky began talking about all the various elements, she exclaimed, "The narrative is hopping away from me like a kangaroo!" There are: dogs, Nazi scientists in the U.S., a drug addict, corporate malfeasance, the Department of Homeland Security spying on Warshawski, physicists and nuclear bombs, missing people, and squabbling women... just to name a few items in that bounding narrative. When asked if she'd ever thought about V.I. 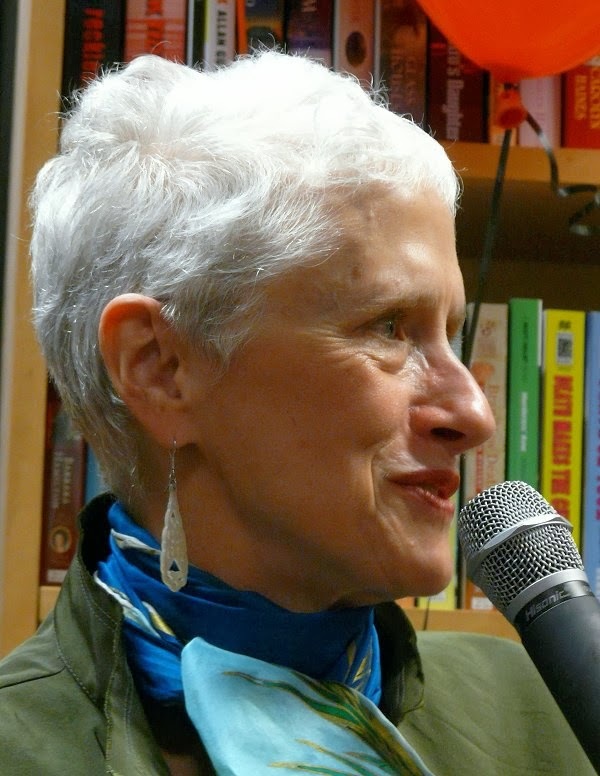 having children, Paretsky said yes, she had thought about it when the character was younger. "But what would she do with a baby? Put it in the backyard with the dogs?" to which Barbara Peters suggested, "A Harley with a sidecar?" to smiles and laughter throughout the room. Another fan wanted to know why Warshawski seldom carries a gun. Paretsky had spoken to someone who never took her gun with her because she learned early on that a gun always-- even unconsciously-- escalates violence. This made quite an impression on the author, so Warshawski keeps her gun in a safe in her apartment. Paretsky is fascinated with white collar crime in today's world because it revolves around perpetrators with vast resources at their disposal and the lack of independent journalists to uncover what's going on. There was also talk about the south side of Chicago and the fact the V.I. was born at 90th and Commercial. Paretsky smiled and said, "Ask me if I've ever been in that Goldblatt's!" Just hearing this author mention the names of area retailers engulfed me in a wave of nostalgia for my roots in Illinois. The evening wound down with a question about Sara Paretsky's reading habits. "I love to read!" Sara exclaimed. "I read mostly fiction unless I'm doing research." When asked for a recommendation, she told us that she really enjoyed Megan Abbott's The End of Everything. I was thrilled to have been able to see Sara Paretsky, and once more there was lots of bookish conversation on the ride home. I just finnished reading "Critical Mass". This book left me breathless. The depth of history was astonishing. I think this is her best work to date. I've been hearing that from a lot of people, Bella. I've got to move it up my TBR list! Omigosh! I put Critical Mass on my library reserve, and I breathlessly await getting my hands on it and reading it. Now, this is an event I wish I had attended. 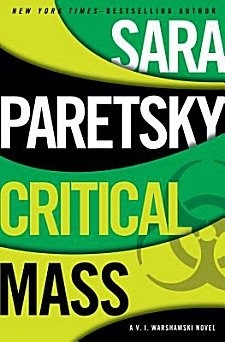 Sara Paretsky is one of my favorite authors and has been since V.I. Warshawski first entered the world of private eyes. There is not a book I haven't enjoyed, and often learn something from reading it. Yet, V.I. entertains me and I enjoy her sense of humor. On top of this, I lived in Chicago during my elementary school years, and look back fondly on that city. I just can't wait to tear into this book, and enjoy it. This, despite WWII being my least desirable period for novels. But, if Sara Paretsky had to go through what she did in Vienna, I'll patiently read the book. I share the perilous situation of her grandparents with her. Mine fled czarist anti-Semitic pogroms in 1907. 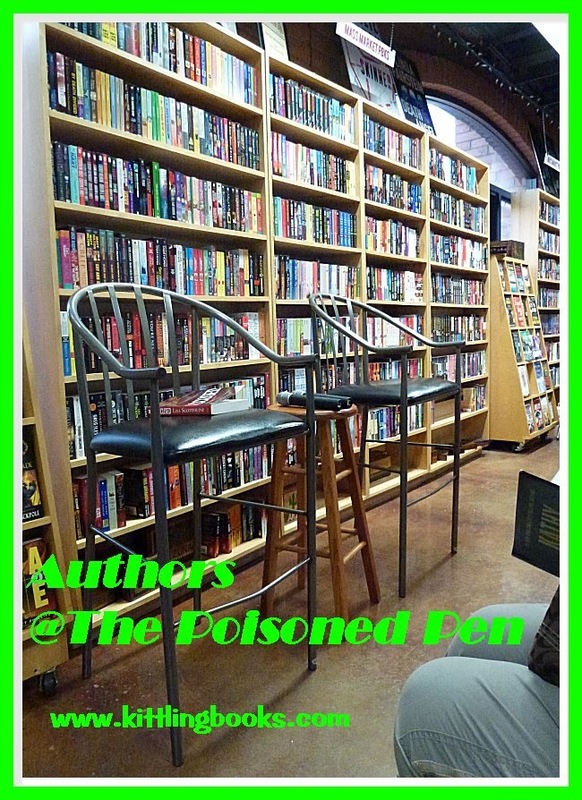 I so wish I had been at Poisoned Pen to hear her, but thank you so much for your thorough and delightful review. I thought of you several times that evening, Kathy, and also as I wrote this recap. I'm glad you enjoyed it. And, also, I have great respect for Sara Paretsky's life of activism in the Civil Rights Movement, and in her travels around promoting the First Amendment and civil liberties today. You're exactly right; she's not just a bestselling author. Not at all! Cathy - Such a great evening!!! And Paretsky has mad such a difference with her life, not just with her writing but also with her activism. Truly a woman to be respected. Well, I got Critical Mass today and regard her like a gold treasure. Unfortunately, I have tasks ahead, but I'll do them quickly, so to get to the book. Let's hear three cheers for bookaholicism! Okay, so I'm 100 pages in. Sara Paretsky is at the top of her form with this book. the next few days, interfering with the reading. I keep hearing that about Critical Mass. I definitely have to read it! read about. This one will send me to the Internet because of historical questions and also there is a lot of scientific information here, which may require more explanations. Definitely my kind of book-- and it sounded that way during the event that evening.